Yes, I received product from Lamps Plus in exchange for writing about their product and company. Again, I only work with companies I love and use in my own home. 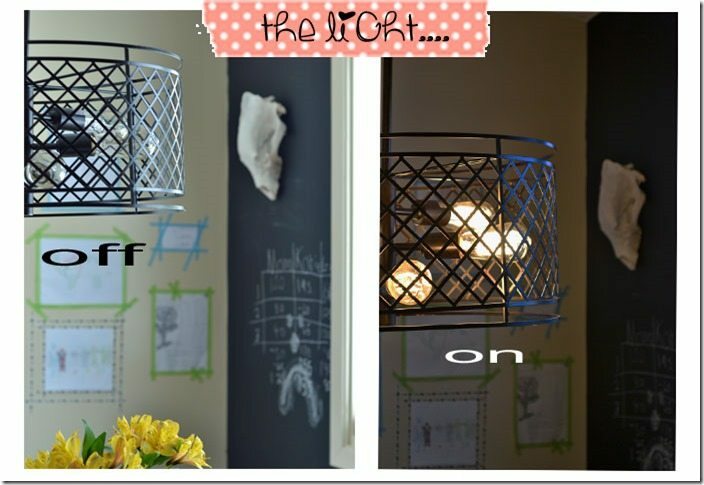 I was beyond happy with Lamps Plus and will gladly work with them again. 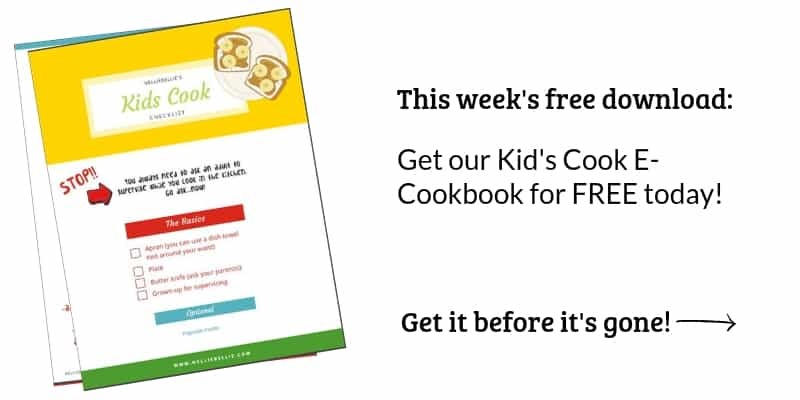 Go here for our full disclosure. Big thanks to Country Living Magazine for featuring my chalkboard dining room walls in their 14 Gorgeous Home Decor Items your guest can play with article. To be told my home is both gorgeous AND play-worthy is the ultimate in compliments. Having a home work for us comes before beauty. Being able to have both? Well, that’s just greedy :). It’s been a while, perhaps you don’t remember my desire to “manlify” my living spaces. I haven’t forgotten. No siree…it has just taken more time then I realized. I had a lot of pink, ruffles, and froo froo thrown about in my decorating! But, I am happy to say the dining room has been de-froo froo-ed (how the heck does one make that a word?). Thanks to LampsPlus for the fabulous, fabulous chairs and light!!! Seriously, love those chairs. I need to get 2 more because the kids call “dibs” on them and don’t let Nate and I sit on them. Of course, they fail to realize that at any point I can call “MOM” on them and take them right back. Gotta pick your battles, I figure. Anyways, I’m calling my dining room decorating “industrial schoolhouse”. It makes me sound all design smart and everything. Truly, I don’t care what it is…I love it! You let me know if you have a better style name! And be kind when you see the before picture! Nuff said. Let’s get on to the photo’s, shall we? I’ve had quite a few questions about that wall color. That’s just plain ol’ chalkboard paint baby! But, isn’t that the coolest color! 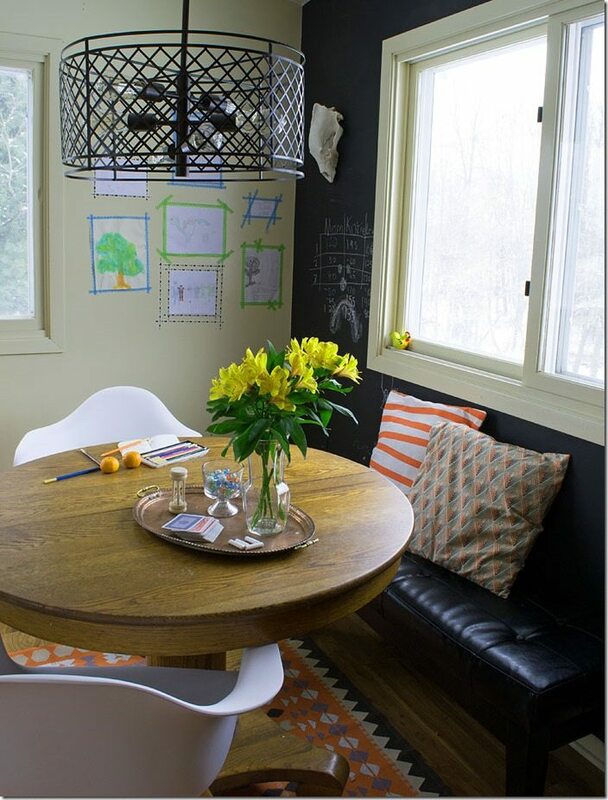 Love love those chairs from Lamps Plus? Have I mentioned that? Don’t they just make the room!! The view from my kitchen…not too shabby! More pictures, just because. Can’t waste a good makeover, wouldn’t you agree? 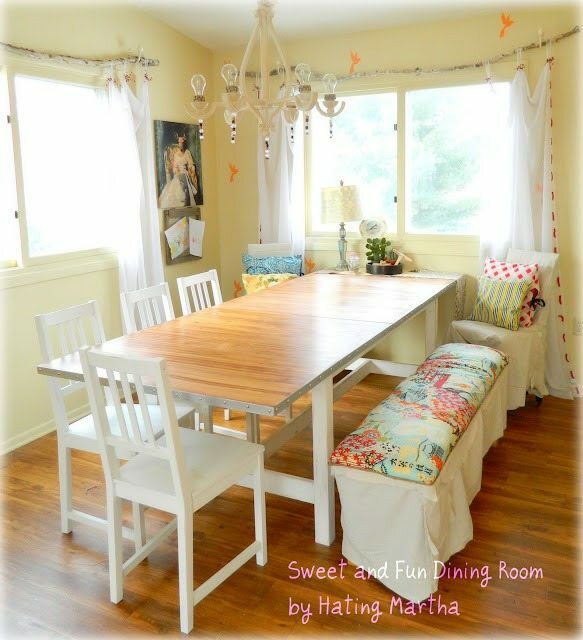 Oh, did you see my dropcloth rug looking all fiinnneee under the table? The kids have already added their touch to the chalkboard wall. It was empty for maybe one night. 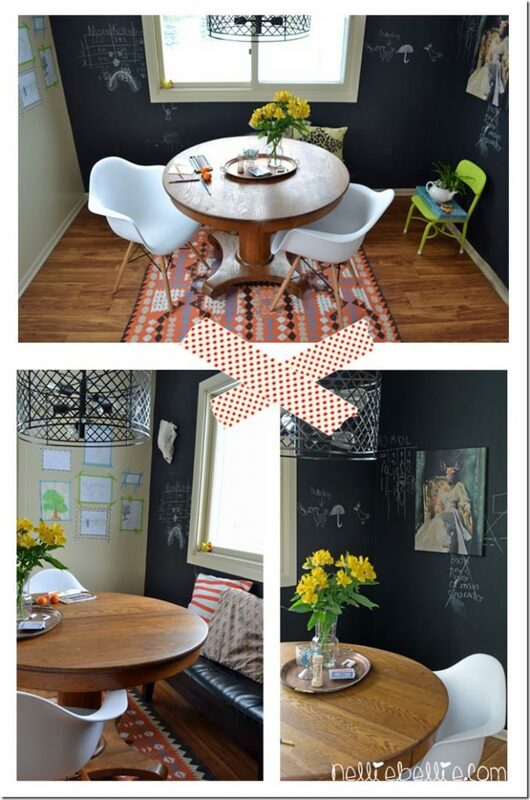 They obviously don’t know the rules of curing a chalkboard wall. Oh well. It’s being used for keeping score of our card games, writing letters to each other, drawing funny cartoons, and playing hangman. 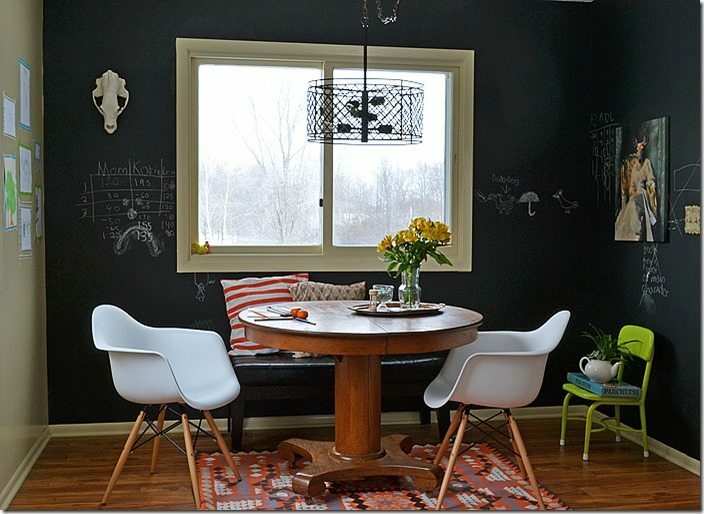 I think the chalkboard wall is going to be a fun addition to our meal times. 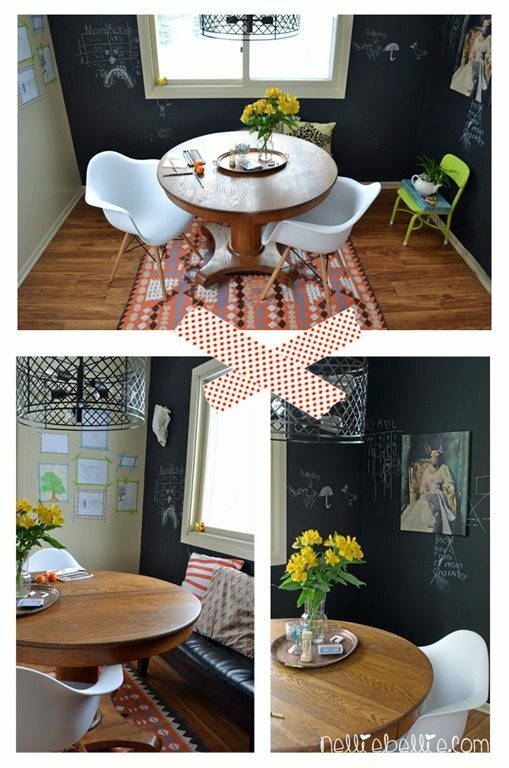 Doesn’t everyone need a wall to draw on while they eat?? There is that bear skull I’ve been chatting about on Facebook. It’s hard to see in the picture but that guy got covered in Modge Podge and then rolled in white glitter. He’s glammed up! And the only glitter in the entire. room. anywhere. Go me! I think I score anti-froo froo points by putting him on the wall…don’t you think? I wanted a gallery wall in the one corner but didn’t want the commitment of nails in the wall. Nor did I have the patience to deal with frames…so inconvenient! So, I taped my kids artwork on the wall with washi tape and made quick frames. Isn’t that adorable! I wonder why on earth I ever bothered with frames. Along with the fabulous chairs I got from Lamps Plus I also picked out this fantastic pendant light. 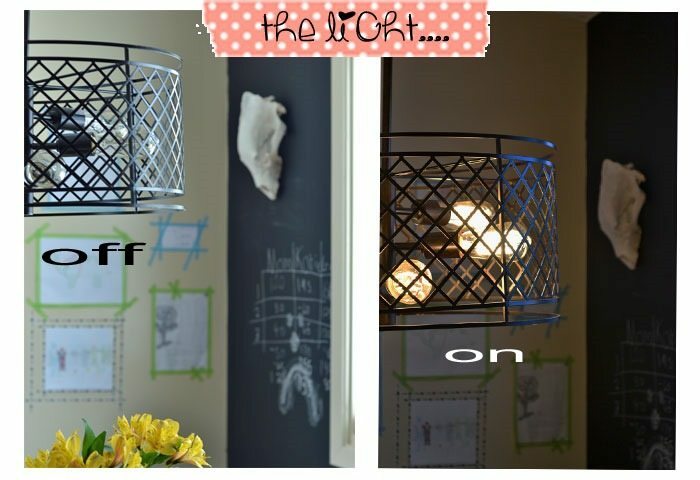 I’ve had my eye on some industrial style light fixtures for the dining room for awhile. I love the look of the metal and the exposed bulbs. The shape and size look fantastic with our antique round oak table. A big ol’ giant hip bump, high five, and squishy hug to Lamps Plus for the fabulous chairs and lights!!! Seriously….I can’t even thank you enough! 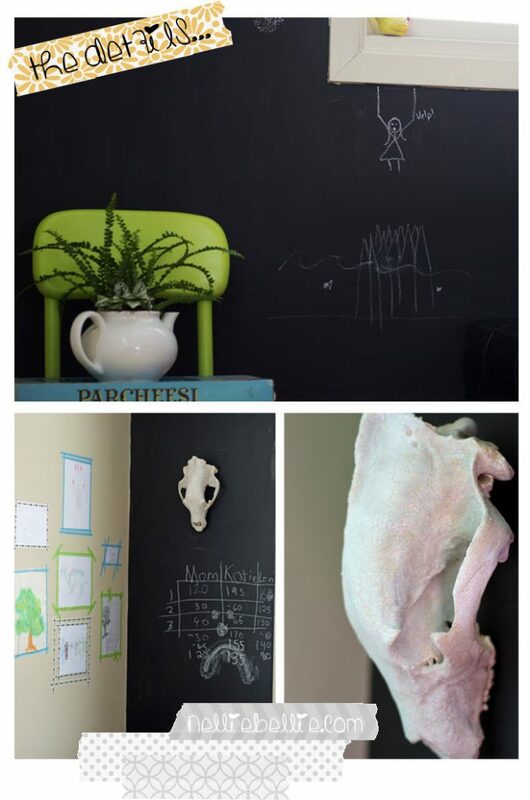 Check out this article for more great ideas on how to use chalkboard paint! I’m really REALLY interested in the chandelier and I think it would go perfectly in my dining area but I don’t see it on the Lamps Plus website. Can you give me any other information on it?